Providing you the best range of master tugger hydraulic tube puller and continuous tube puller with effective & timely delivery. We deals in Master Tugger Hydraulic Tube Puller. Compact and lightweight gun and power pack. 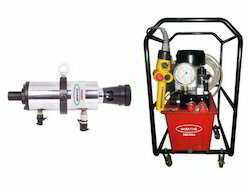 High pressure pump for pulling toughest jobs. Low set up time / ease of operation Automatic switch over from low pressure to high pressure. Interchangeable pulling gun accessories compatible with existing systems on the market. We deals in Continuous Tube Puller. » Available with a choice of Electric - BTPP System or Pneumatic - BPPP System for hazardous, explosive working environments. » Pulling gun communicates with power pack via DC remote control. 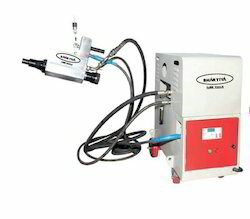 This ensures safely and eliminates the need of electrical cord between pump and gun that other manufacturers provide. » Microprocessor controls on power pack and gun ensure trouble free life. » Low setup time and ease of operation. » Removes tube without any damage to tube sheet. » High power High speed automatic cycling, for highest speed of pull available worldwide. » Auto switchover from low pressure high flow to high pressure low flow on load and again back to low pressure high flow when load is released. » Automatic slow start feature to minimize risk of breaking tubes and to conserve consumables. » Compact design of Power pack and Gun. » Interchangeable pulling guns with same Powerpack. 15 ton gun for light duty high speed work, 30 ton gun for heavy duty tube pulling and 45 ton gun for tubes up to 3" O.D. » Significant saving of time and money over conventional system. » Low maintenance cost and worldwide availability of components. » Unit is portable with handle and mounted on four wheels for easy handling. » Pulls up to 3" OD tubes continuously, pulls up to 4" O.D. stub. » Unit will pull tubes continuously through the gun effortlessly, needing only one man for operation.